Prepare 20 oz. of frozen soy beans (edamame) according to the package instructions. While the soy beans are boiling, add fresh green beans (approximately 3 cups). Drain well. Rinse one cup of lentils several times and then boil for 20-30 min or until tender. Drain well and mix with the soy beans and green beans. 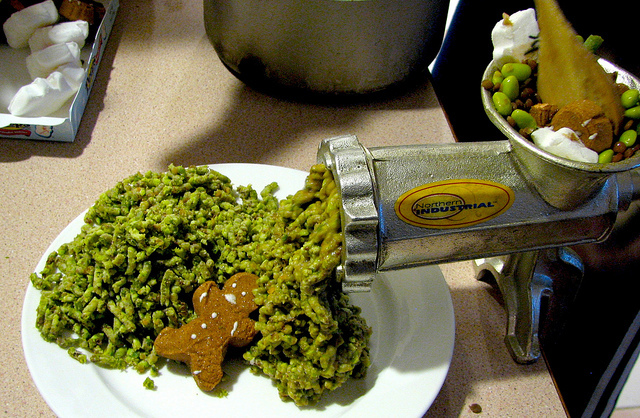 Grind the soy-lent-green mixture with the secret ingredient that serves as a binder and adds additional calories in these troubled economic times. Soylent green beans is Peeps! Spread the mixture evenly on a greased cookie sheet and bake at 400 F for 45 min or until the biscuits are dry. Allow to cool and cut into squares. Kim: Even just remembering it makes me nauseous. Kristen: It reminds me of baby food. Not sure how I know what baby food tastes like, but it tastes like this. 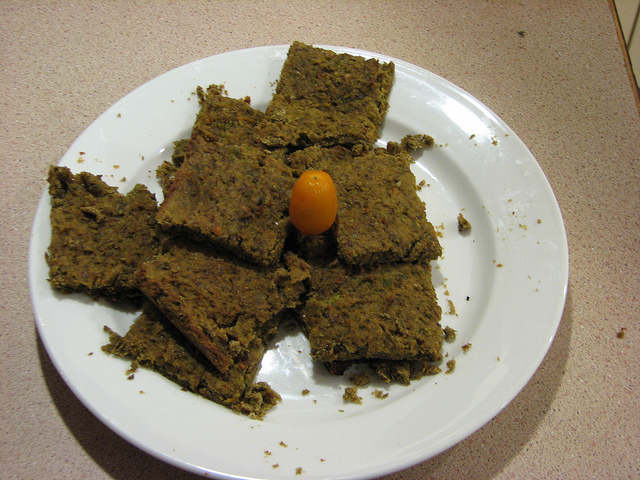 The texture was a bit too crumbly, so we should have used eggs to hold it together better. Some butter might have improved the taste, though it was not at all bad. It had a surprising sweetness. Certainly in the “dessert vegetables” category. Beth: It was pretty good. It tasted a little like lentil soup, and a little like the dried green bean snacks you can get at Whole Foods. I guess that’s not too surprising. The texture was like a chewy cookie. I think it would have been better if it had been baked longer at a slightly lower temperature. I ate mine toasted, and it was better warm. The combination of all the flavors and the form factor made me think of a damp Power Bar. Alex: It was pretty good when toasted and spread with butter. It reminded me of samosa filling. This entry was posted in Uncategorized and tagged Soylent Green. Bookmark the permalink.